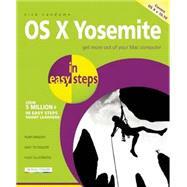 OS X Yosemite in easy steps covers the essentials of this operating system for Mac desktop and laptop computers. Step-by-step, it’ll take you through OS X Yosemite’s abundant features to help you get more out of your Mac. Packed with tips and shortcuts, this guide will get you up to speed in no time. Ideal for newbies as well as for those upgrading to OS X Yosemite. Nick is an established In Easy Steps author with several successful guides to his credit.